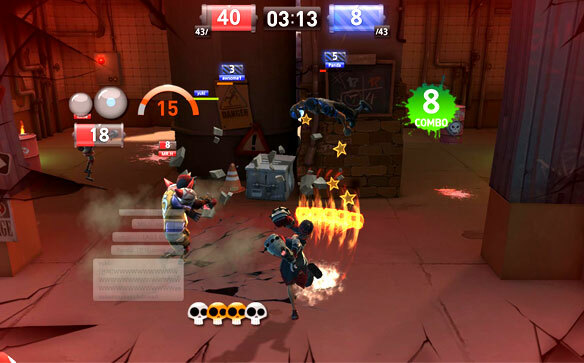 Brawl Busters, a third person beat 'em up, entered the closed beta stage this week. As it's only beta, not everything was available. What was available was the single player tutorial levels, and online battles. Was it any good? Read on to find out! The first thing you must do is choose your character. You can go for the small, medium or large males and females. The size and gender has no affect on the abilities, it's just a nice touch of customisation. 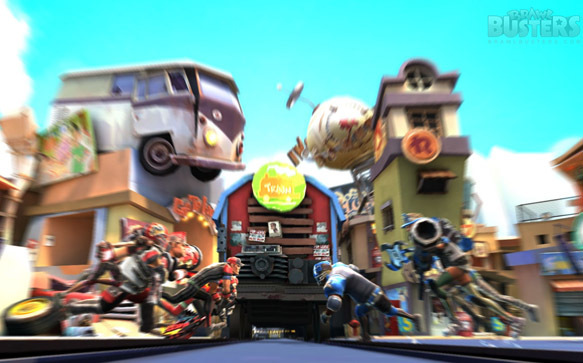 Then comes the introduction to each of the five classes, which are the rocker, the slugger, boxer, blitzer and the firefighter. The rocker is the standard class. Decent at everything but excelling in nothing. The best class for a beginner, as the moves are not complicated; there are no defensive moves which require a different style of play. You have the standard guitar bash, which sees you swinging your guitar heavily towards your opponents, with only one intention: immense pain! 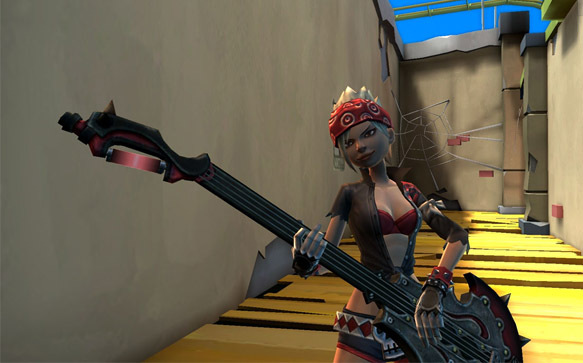 The secondary move is a ranged attack, sending sound waves from a played chord at the enemy. It's not very powerful but is helpful for keeping enemies at bay. Each character also has a special attack, which is used by holding both mouse buttons. It takes a couple of seconds to charge, to avoid overuse. The rockers special move is a huge blast, knocking down everyone in a decent sized radius. The slugger is a ranged character, opting for the baseball and bat combo. Your standard attack is again, a normal hit, this time with a bat. The secondary attack sees the slugger smack a ball towards the opponent. Luckily, the balls have a homing feature, so chances of missing are low. The special attack for the slugger sends three powerful balls sailing towards the enemies. It can take down multiple opponents if used correctly. The only problem with the slugger is that the health points are lower than other classes, to strike a fair balance. The boxer is a small, fast character, with slightly lower health than other classes. The boxer launches fast punches at the enemy, with extreme force. The secondary attack is an extended lunge, which is great for minimising distance between you and your opponent. The special attack launches incredibly powerful punches, with flames! Flames make everything better. The blitzer is the American football player. Slow movement, but better than average hit points make it a good class for getting stuck into each and every fight. The primary attack is a football tackle, whilst the secondary is a touch down move with a small blast area. The special attack for the blitzer is a combination of the two standard attacks. First, there is a spinning tackle lunge, followed by an intense touchdown, with a huge area of attack. Finally, we have the firefighter. Not only is the firefighter a decent attacker, but it has the best defensive move out of all the characters. The primary attack is a continuous blast of water, wide enough to affect numerous enemies and strong enough to slightly push them back. The secondary attack gives a new meaning to the name fire fighter, as balls of fire are launched at your enemies. This is the longest ranged attack in the entire game. Finally, we have the fire fighter's special move. 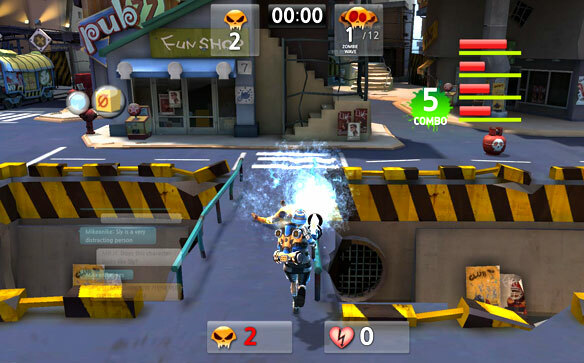 Charge up your special move and a defence barrier will appear, blocking anything trying to get past for a short time. It doesn't last long, but long enough to deal some damage with your other attacks. The multiplayer is the main mode of the beta, and puts you in a team deathmatch. Using your preferred class, you must use your abilities to beat the crap out of your opponents! Using various power ups that randomly spawn throughout the map, you can blow up, confuse your opponents with a fake version of you, and you can even teleport if things are getting a little hairy.tOt is a good laugh for a while, but there isn't enough variety to keep you entertained for too long. Obviously there will be more online modes and maps in the full game, so fingers crossed that they sort it out. The challenge missions should be great though. The tutorial challenge levels were great fun, as you take down zombies and explore more open levels than the deathmatch has to offer. They are also a great opportunity to get to grips with each and every character. 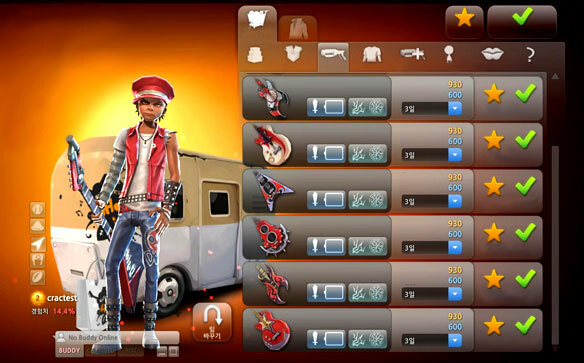 Playing the tutorial for each character also unlocks new customisation items. It could be a hat, jacket, pants or weapon, but whatever it is, it is fun to customise your character. There are many other items on offer in the store, including more powerful weapons and clothing with better defence, but there is a strange expiry system on every item. You use Busters Points (attained by playing well in-game) to buy items, or more accurately, to loan items from the store. It's a very weird system and it's hard to see it working very well for too long. 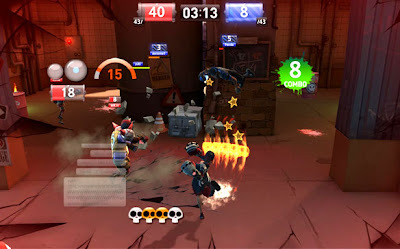 Brawl Busters is still a fun little game, despite a few odd choices by the developers. Still, it's only the beta, and I can't wait to try out the full game. Brawl Busters set to release later this year.